Yesterday at the studio, I was sealing the sides (unpainted canvas edges) of this painting. This meant that I had the painting upside-down on the easel, and then on its side. I noticed that one side of the vase was not right, so I fixed it, checking my work in the mirror. (Sometimes you see things differently from a new perspective.) At this point, I would bet that I will still find little areas to fix and lines to straighten out on the canvas; nonetheless, I am posting this today as the final version of the still life, because this is it, essentially what I set out to paint the first day I brought the purple and white freesia up to the studio. I went back to the studio at Red Brick this morning, and finally had a chance to start a new collage project, using some beautiful wide ribbons that a friend of mine gave me. I also wanted to try out the idea of using styrofoam (grocery store tray) as backing, although I still don't know how well the ribbon will stick to the styrofoam, and I don't know whether or not the ribbon will dry flat. But I will find out, and no matter what happens, I will learn, so it is worth trying. I started with a ribbon that has a pattern with great big roses on it. I cut out three of the roses. Then I pasted the rest of the ribbon down for the background, and pasted in the three red roses, arranged to suggest the image of flowers in a vase. By the time I got that much done, it was time to leave, but that gives me time to think about how to create an image of a vase. Anyway, this is what the collage looks like so far, with the raw edges of the styrofoam tray cropped out of the photo. Well, last week I stated that this painting might be finished, but as it turns out, I was wrong. Something was bothering me when I looked at photos of this painting. I wanted to get back to the studio to check on the geometry of the vase and figure out what was wrong. 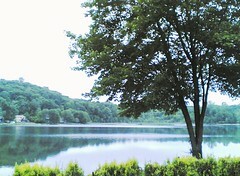 But it was a busy week, and the temperature went over ninety, too hot to work in the studio. But this morning, it was a bit cooler, so I got up early and went on over to Red Brick. I had an idea for a new collage project, but I thought I would spend a few minutes fixing the vase issue. When I measured, I discovered that the vase was no longer in the center of the canvas; apparently as I worked on the shape of the vase, I had made it wider on one side than the other. The difference was a matter of a quarter of an inch or so, but worth fixing. That sort of mistake registers with people when they look at the painting, whether or not they are aware of it, and becomes a distraction. Well, the few minutes I intended to spend on this problem turned into an hour, and I never got to the collage project at all, but I did manage to move the vase closer to center, working with my ruler and my T-square. "Measure twice, cut once" is the carpenters' saying. Good advice for life, good advice for art. This is a very small watercolor landscape (five by seven inches) that I painted several years ago using my little portable watercolor set. 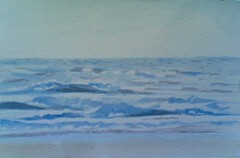 That summer, I spent a few days at the New Jersey Shore and spent time walking along the beach, looking at the water, and trying to learn to paint the ocean. (I was born and raised in Colorado, and didn't really even get a chance to see the ocean until I was in my twenties.) Anyway, the other day while I was organizing my stuff, I came across some small watercolors and drawings, and found this one. Although I am north of Boston today, rather than in New Jersey, I thought I would post this because it is SO hot, and everyone here could use a nice ocean breeze. I took this photo today at Home Depot, in the garden section. (I was running errands with my daughter.) 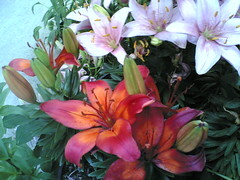 I saw a display of beautiful daylilies, and started taking pictures with my phonecam. This is the photo is the best one of the set, and is exactly the way it came out of the camera. 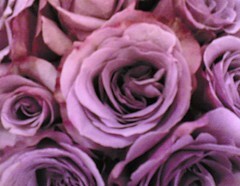 At the grocery store, I noticed some unusual roses that had a purple cast, somewhere between dusky pink and lavender. 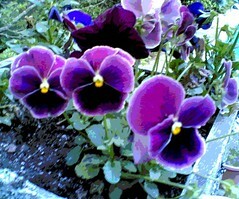 I loved the color, so I took a picture with my phonecam, moving in close to capture the detail of the petals. Tonight I corrected the color in the computer and then cropped the image just a bit to get the composition I wanted. This morning I was weeding the garden, and saw lots and lots of buttercups. 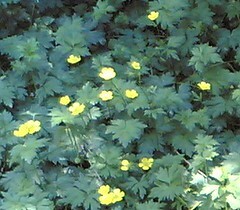 I liked the play of sunlight and shade on these little flowers, so I took some pictures with my phonecam. Tonight I cropped this one just a bit to get the composition I wanted. The other day, I noticed these flowers in my daughter's kitchen. 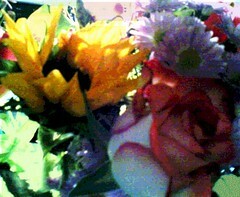 I liked the way the late afternoon sunlight was playing on the flowers, so I took a picture with my phonecam. The result was a nice soft focus but the image was too dark to use. So tonight I adjusted the contrast, then cropped the photo for the composition I wanted. Then I opened the image in Painter IX, where I posterized it and added some soft color overlays where the photo was too bright. This morning I worked on this painting at Red Brick. First, I changed the color of the tablecloth, bringing it back to pink. I added more dark purple tones to the brick, for more contrast. I rechecked the geometry of the vase, then added some light blue and green to the glass. Is this painting finished? I am never entirely sure, but right now I will say that I think it is. Tonight it start to sprinkle, and then rain hard, during an evening "dog walk". By the end of the walk, I was drenched but I was laughing too hard to mind. I was also moving too fast to take any pictures. But tonight after I got home, I found an image that started with another walk in the rain, a few years ago. (I was walking and taking photos, and lost track of time, didn't notice the sky, didn't mind when it sprinkled, and finally took notice when it started raining buckets, and when I got home I was drenched and laughing, just like today.) 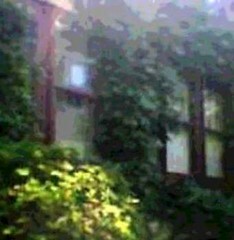 This is one of the photos that I took on that walk, using my late, great first phonecam that took soft, fuzzy little images. Tonight I decided to salvage the image and I began by resizing it, and cropping it for the composition. Then I opened the image in Painter IX and posterized the photo, experimenting with levels until I had the effect I wanted. I also used some very soft color overlays in one or two places that were too bright. Then I re-cropped the image, and here it is. 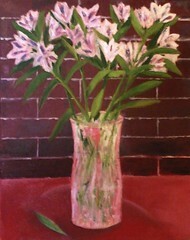 I got up early this morning and went to Red Brick to work on this painting for a while. I made a change in the drapery of the tablecloth, then added more dark tones to the brick. After that, I turned the painting on its head for a while to try to correct an issue with the elipsis at the bottom of the vase. Then I turned it around again and added some highlights to flowers and petals, indicating where the light was hitting them. I also worked on the vase, adding some shapes for the foliage inside the vase, and putting some white and lilac tones in the glass. At that point, it was time to pack up and leave for today. To be continued. . . . 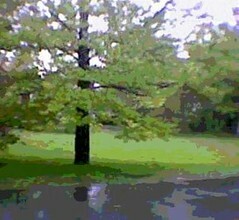 This image began as a photo taken a few summers ago, with my old phonecam that took soft, out-of-focus images. At the time, I was doing a painting of a house for my friends, and was taking some pictures of ivy for reference. Tonight I came across the reference photos, and decided that I liked this one enough to do something with it. The light was unusual, sun and morning fog as it was lifting. So I did some rotating and cropping, and then adjusted the contrast a bit. Then I opened the image in Painter IX and posterized it. I did a little more cropping to get the image I was after, and here it is. 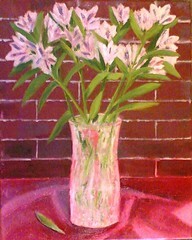 This morning I went to the studio at Red Brick and worked on this painting for an hour. First, I worked on the tablecloth, trying to even out the color while still showing highlights and shadows. The tablecloth still needs a little work, and I can already see some changes I want to make in the drapery. But I am happier with the color. I also added more purple tones to the brick, to add contrast with the tablecloth, and to add texture. I also added some white to some of the flowers and to the vase. There are some reflections in this photo because the painting was still wet when I took this picture. To be continued. . . . This week, while I was supposed to be working in the yard, I stopped for a few minutes and used my phonecam to take some pictures of these pansies in the windowbox. It made me smile to look at them. Tonight I cropped the image to focus on the faces in the flowers, and then posterized it, using Painter IX. 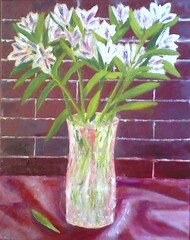 This morning I went over to Red Brick to work on this painting for a while. I am still working on the tablecloth. For reference, I used the photograph of the original still life setup that I taped on the wall last week. Today's goal was to get the folds of cloth to make sense in the painting, so I looked very hard at the shadows and highlights in the photograph. 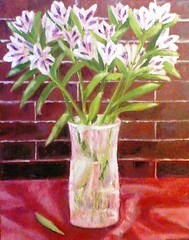 I began by working with a palette knife, but ended up applying paint with my fingertips. Although I didn't get to finish, I think this shapes in the tablecloth are getting better. 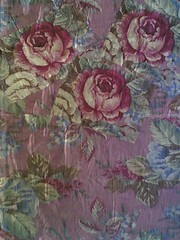 However, once that part is finished, I will need to bring the color of the tablecloth back to a dark pink. To be continued. . . . 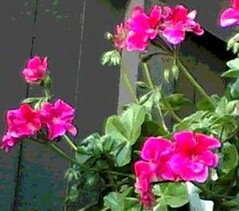 This is an image of a basket of geraniums hanging near a wooden fence. I liked the contrast of colors and textures, so I took some pictures with my phonecam. Later, I cropped this image out of one of the photos, and then posterized in using Painter IX. 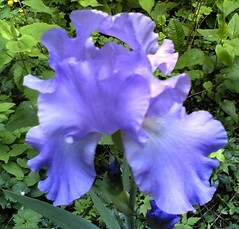 Yesterday as I was rushing out to do Something Very Important, I noticed that this purple iris had opened. 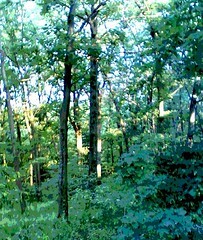 It was so beautiful in the dappled sunlight that it stopped me right in my tracks. I took a few minutes to take some quick pictures with my phonecam. Today I cropped the image just a bit to focus on this one beautiful blossom. Art is also Something Very Important, and so is taking time to look and enjoy. 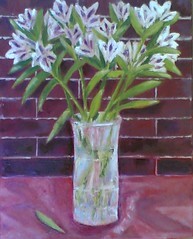 This morning, I went back to the studio at Red Brick to work on this painting. The original flowers I was working from are long gone, although I did put a fresh bunch of freesia in that vase for Open Studios. The red tablecloth is gone as well. But when I began this painting, I took a reference photo of the still life arrangement. So this morning before I left for the studio, I printed out a copy of the photo to take along. I taped the reference photo up on the wall, and it was helpful to have it. During the hour I had to work, I concentrated on the red tablecloth. I am trying to give it more of a pink cast (as in the photo), and to create a sense of the light coming in from the windows (on both sides.) I also want to give a sense of the folds in the tablecloth. Although I wasn't trying to replicate the tablecloth exactly (I needed to make some changes for the sake of the composition), looking at the photo helped me put highlights and shadows down on the canvas with more confidence. 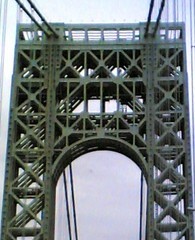 This weekend's drive from New York City to New Jersey included driving across the George Washington Bridge. It is a beautiful bridge, and I took lots of pictures with my phonecam (from the passenger seat, of course.) It is not always possible to get a good photo from a moving car, but stop and go traffic has its advantages. Tonight I cropped one of the photos to get this image, which calls attention to the geometric patterns in the structure of the bridge. 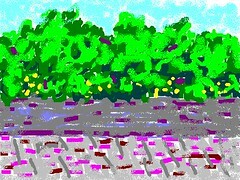 This is a sketch I made this morning on a lap-top paint program. It is a view of Central Park seen from the M10 bus. I had a nice long look at this view yesterday as I sat on that bus, following some transit adventures in the NYC subjway (no uptown trains were running). But I enjoyed an interesting view of the park. I liked the patterns of the sidewalk, the patterns of the stone wall, and the repeating patterns of flowers and trees as we (slowly) moved uptown. Over the past week, I have seen the flowers on this hedge getting ready to open. 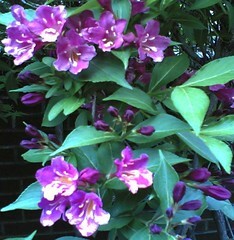 I like the color and shape of its buds as well as its blossoms. I thought it looked nice against the brick wall, so I took a photo with my phonecam during a recent walk. Tonight I cropped the image slightly to correct the composition. Just as I was getting ready to post the photo, I noticed a distracting mark on one of the leaves, so I opened the image in Painter IX and used some digital pastel to eliminate the mark. Now there is nothing to distract the eye from the sunlight on these flowers as they blossom. This morning, I spent a little time at Red Brick. I had to go there to pick up some paintings so I could drop them off for framing, and then took about 10 minutes to restore the studio to its natural state as a workspace, after Open Studios. But to me, going to the studio and not making any art is like going to Baskin Robbins and not having any ice cream. So while I was there, I decided to take just about half an hour to work on this painting, which was all the time I could spare today. I focussed on the tablecloth, adding a little light and shadow, and trying to work out how to suggest drapery with oil bars. I was happy to be painting, even for such a short time. To be continued. . . . I always try to take pictures of New York City from the train, but it is surprisingly hard to do. It seems that whenever you would actually be close enough to get a great picture of the New York City skyline, you are in the tunnel connecting to Penn Station. But I keep trying. 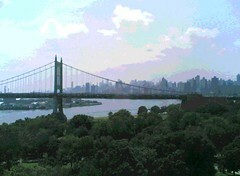 I used my phonecam to take a photo through the train window last July, during a very short trip to NYC to visit family. Tonight I adjusted the color slightly (to compensate for the dark train window), and then opened the image in Painter IX and posterized it. Late in the day, I was taking a walk when I noticed the long rays of the sun on the trees. I had to stop to take some pictures with my phonecam. Later, I cropped the image, then opened it in Painter IX to posterize it. It was pouring this morning when Mel left to catch the train to New York. (It is still pouring.) I imagine this is what the view through the window of the train was like. 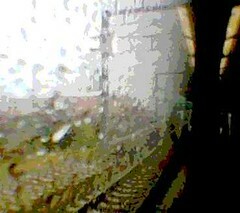 I love trains, even in the rain, but I do like to look out the windows. This image started with a picture I found tonight, a photo I took with my old phonecam on my own train trip to New York last year, also on a rainy day. I came across it when I was looking for a New York City picture to post. I liked the original photo (taken with my late, great phonecam that took soft, out-of-focus pictures), but I decided to try posterizing it to give the image more punch. Then I adjusted the value to make the image easier to see. The result is a little odd, but here it is. I like it because it kind of re-creates the effort to see what is whizzing past, through the foggy windows and the rain. This is another photo that I took on a recent walk at Long Hill Gardens. Fitting these little expeditions into a busy day isn't always easy, but it is well worth it. 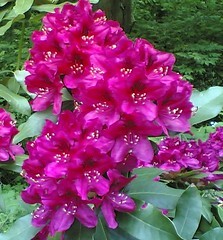 That is especially true now that the rhododendrons are blooming, and in so many colors! This is one of the many pictures I took that day. I feel I should point out that aside from cropping this photo, I did nothing to it. The color in this photo is just as it came out of the phonecam: unbelievable! Watercolors of Portugal (At Open Studios) Originally uploaded by randubnick. I took this photo in my studio at Red Brick. 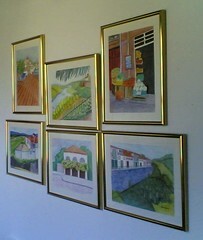 My studio is the world's smallest, but I wanted to hang some of my watercolor paintings of Portugal for Open Studios this weekend. I managed to make room for six of them. I am glad I did because I had a chance to share some memories of my visits to Portugal with the people who came to my studio. Red Brick is having open studios this weekend. For the past few days, my time at the studio has been spent getting the studio ready and hanging my work. Space is tight, this being after all the world's smallest studio, so I needed to move things around. I rearranged my second set of transformational drawings in a tighter configuration. 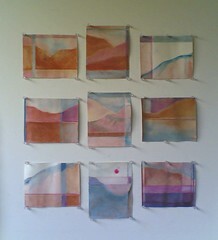 (These are small drawings made by drawing into 9 pieces of a larger painting of mine, cut up for recyling). Anyway, I liked the way this set of drawings looked pinned up on the wall, so I took a picture with my phonecam.